I have had my eyes on Peanut Balls for a while, they are an excellent way to improve core strength and positioning for desk work. So when Fun and Function asked me to check out their Amazing Peanut Ball, I was very excited to share about it with you all. 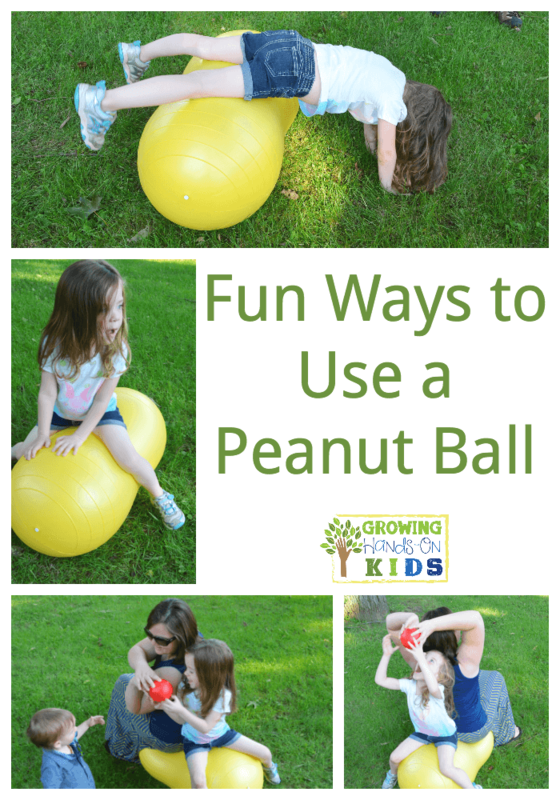 I received a free Peanut Ball from Fun and Function in order to complete this review. All thoughts an opinions are 100% honest and my own. My daughter is 4 year's old and I have been wanting to challenge her on some core building and crossing midline exercises. This peanut ball is the perfect thing for both of these skills. 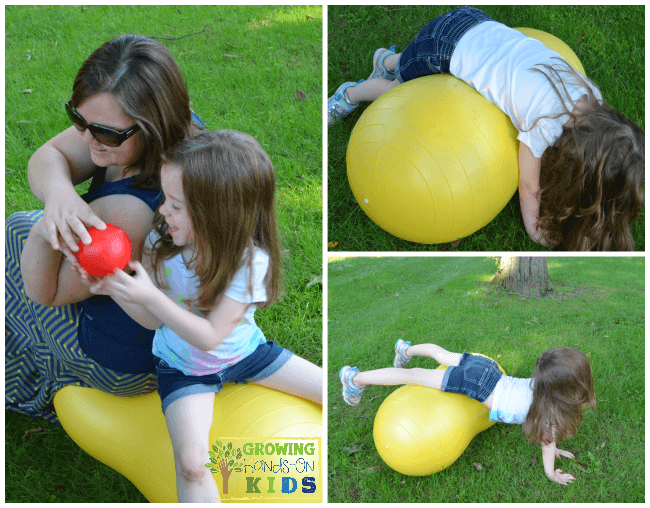 Rather than using a typical, round therapy ball, the peanut ball allows for the child to grip the sides of it with their legs, adding more stability. This also makes it the perfect seating option in a classroom or at a desk at home as well. It provides more stability than a regular therapy ball and offers multiple ways to sit on it, such as straddling or sitting on it like a log. You will probably need to get a larger size, depending on the height of your desk or the size of the child. We have the medium size, yellow one for this review and it seemed to be just the right size for my 4 year old (she is just over 3 feet tall). It is especially helpful for children with Autism. The Peanut Balls for designed for ages 3+ and made from Latex and BPA FREE PVC. They are also super sturdy and can hold up to 750 lbs. Fun and Function offers sizes from small to extra large to accommodate a variety of children and heights. You will need an air pump that is NOT included with the balls, so make sure you already have one or you can purchase one additionally from Fun and Function with your order. Fun and Function is a great company that offers toys, games, clothing, and therapy products for children of all abilities. They offer affordable pricing, high quality items and kid-friendly designs that make them a go-to destination for many families and health professionals. Be sure to check out their Amazing Peanut Ball and use it in your homeschool or classroom this year!